Photo on left shows Delta-3 Plus with Delta-Vis display. Delta-1 is same except paper is 60mm wide. Model Delta-1 Plus Upgradable may be upgraded with other listed options at any time. Non-upgradable version accepts no options. Prints on 2.5" wide (60mm) strip-size ECG chart paper, roll or Z-fold. Three automatic recording formats, with and without interpretation and /or measurements only without interpretation, 1 arrhythmia recording format and 2 manual recording formats (single or 3-channel). 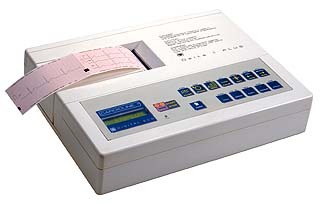 If desired, an extended measurement table and an average waveform for each ECG lead may also be printed. 3 Channel print format - saves paper, reduces paper costs, saves time, easier and quicker to "read" for the doctor, more clinically valuable than a single channel format - provides 3 simultaneous views of the heart. The optional interpretive printout mode provides an immediate, accurate and reliable ECG interpretation with all standard ECG measurements and supporting statements with a 4-second simultaneous recording of all 12 ECG leads in a 3-channel format. Heart Rate (HR) display on the LCD, which also indicates whether or not the ECG signal is stable and of good quality. ID #, height and weight can be printed on the ECG report. Compact and lightweight (6 pounds / 2.8 kg) for easy portability. Dual power supply - AC/DC internal rechargeable NiCAD battery. Easy, "One-Touch" automatic operation, if desired. Copies of the last ECG performed can be provided to other facilities and also offers the ability to modify the recording parameters, such as, increasing or decreasing the sensitivity, or adding a muscle filter, prior to copying, to improve the quality of the ECG recording. Two year parts and labor warranty, so it's reliability is guaranteed! Delta-Vis is a 4" LCD monitor permanently attached to the Delta-1. Real-time ECG Management Program # 855-3418 converts Interpretive ECG into a 12-channel PC ECG. For Win 95/98. Suggest you order # 855-3125, 895-0511 & 855-3418. See Treadmills or Ergometer to select an exercise device that can be automatically controlled. Snap adapters are not needed for Stress Test Cable, only for standard resting cable if that resting cable is to be used with snap electrodes.